Archaeoforum.de • Thema anzeigen - Bestattungsritual oder Kannibalismus? Aktuelle Untersuchungen an ca. 58.000 Jahre alten HSN - Knochen aus Marillac ergaben, dass die Schnittspuren und das Aufschlagen wohl kurz nach dem Tod entstanden. “The upper edge exhibits marks of a “post-mortem” impact with conchoidal markings (those that does not follow natural separation positions),” the study sets out. The lower region possesses a clear, oblique spiral break which seems to have occurred while the bone was fresh. “Given the morphology of the fractures, it may be that the body of this child was manipulated shortly after death. The right leg received a series of blows that fractured the femur, and the cut marks identified are anthropic in nature; in other words, there is no visible evidence of animal bites,” Garralda notes. 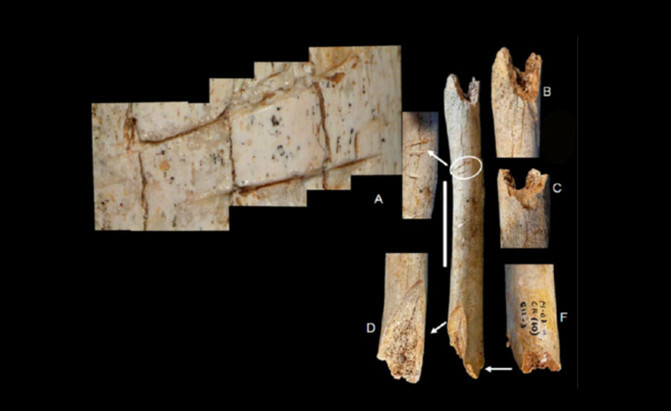 “They might have been rituals – still in the 21st century these continue in certain parts of the world – or for food – gastronomic cannibalism or due to need,” asserts the expert, who remains cautious regarding the hypothesis of cannibalism, due to the large number of animal bones found on the site which could have been Neanderthals’ food. “To date we have been able to demonstrate these manipulations at several Neanderthal sites in Europe, which are of course much more recent, including in groups of contemporary humans, but we have not been able to demonstrate the consumption of human meat by Neanderthals (although this has indeed been done in other much more modern populations),” Garralda details. Jetzt auch aus dem Jungpaläolithikum Englands? "... Goyet not only provides the first unambiguous evidence of Neandertal cannibalism in Northern Europe ..."
"Was sich die Neandertaler dabei dachten, lässt sich leider nicht rekonstruieren."